DxChain Bounty Combo is Coming! We are extremely proud to announce that DxChain (DX) is now available on KuCoin Exchange. Supported trading pairs include DX/BTC and DX/ETH. DxChain Team is deeply grateful for your warm and unwavering support! 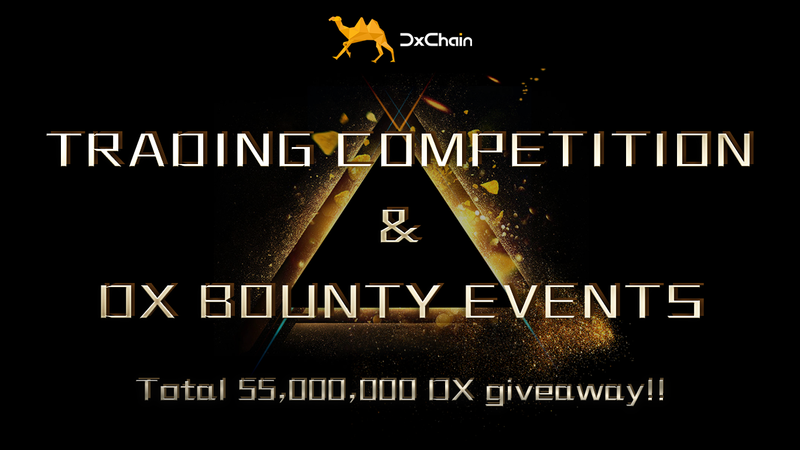 Now, we are running a series of DX bounty events in the next two weeks with total 55,000,000 DX prize pool for all participants! Welcome to join the trading competition and experience the DxChain product — DxBox. Ready for the event combo? Here we go! Rule: DX Trading Competition participants will be ranked according to their trade volume (buy and sell) on KuCoin. Total 40,000,000 DX giveaway to 200 participants. First 3,000 participant can get the reward by finishing the event! a) Start the activity “DxBox Testing Event” with @DxChainBot (http://t.me/DxChainBot). b) Register the DxBox using your email address. c) No registration needed if you’ve finished the last activity. a) Upload files (picture, music, document…) to DxBox. b) Only the file uploaded during the event will be counted. c) You can get the reward only once, uploading files repeatedly will not be counted. a) Finish Step 1 & 2 is required. b) Sign up with KuCoin (https://www.kucoin.com/). c) Send the screenshot of your account back to @DxChainBot (http://t.me/DxChainBot) and pass the authorization check. d) The reward will be issued within 7 days after the activity ends. 1. Finish the step 1 & 2 of【Event 2】is required. 2. Create and publish a video on Youtube to share your review about DxBox. a) The video should be at least 30 seconds long, and only quality original content will be accepted. b) The video title must contain “DxBox”. c) Put your referral link and DxChain’s website address (https://www.dxchain.com/) in the description of your video. e) We appreciate that we have supporters from many different countries and cultures however, we will only accept articles written in the following languages: English, Chinese, Russian, Vietnamese, and Korean. f) The video should be published during the event. g) Each participant can submit multiple videos, however only the last one will be considered. h) The point will be issued within 7 days after the activity ends. i) Reward rules: The qualified video will get 20,000 points standard reward. a) Get your referral link from @dxchainbot (http://t.me/DxChainBot) and share it with your friends. b) The score will be added to your balance once your friends join the group first time by your referral link. c) The maximum reward you can earn by referring friends is 50,000 points. a) Start the Twitter task, follow @dxchainnetwork on Twitter. b) Retweet the designated content. c) Send back your retweet link to @DxChainBot (http://t.me/DxChainBot). d) Your score will be updated within 1 day. DxChain reserve the right of final explanation for the activities. Thank you for your participation in advance, please feel free to contact admin @OliviaDxChain (t.me/@OliviaDxChain) and @LorenaDxChain (t.me/@LorenaDxChain) on Telegram if you have any questions. DxChain is the world’s first decentralized big data and machine learning network powered by a computing-centric blockchain. DxChain is a public chain, it designs a revolutionary “Chains-on-chain” architecture to make blockchain function as a computing unit — data storage and computing, so that the technical characteristics of blockchain can be truly extended to a broader field, promoting the next generation of technology from the bottom. For more information, please visit www.dxchain.com.